Drugmakers have been hit worst among Europe’s largest economies from a one-off U.S. levy on corporations’ overseas earnings, a result of the deal-making boom in the pharmaceutical sector. 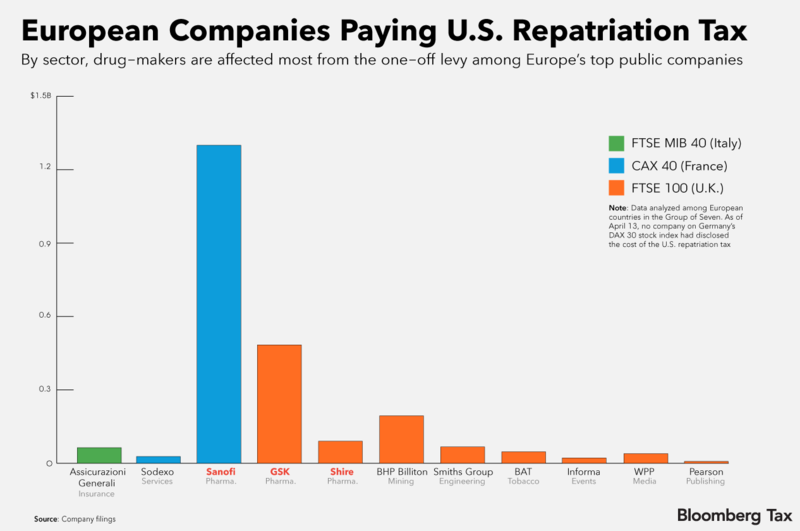 Sanofi, Shire Plc, and GlaxoSmithKline Plc make up 80 percent of the $2.4 billion in repatriation charges faced by businesses on the primary stock exchanges of Europe’s Group of Seven countries. Paris-based Sanofi and London-based GSK have the two largest bills out of this total, respectively paying $1.3 billion and $484 million. Dublin-headquartered Shire Plc faces a bill of $90 million, the fourth-largest overall. The figures are based on an analysis of corporate filings by Bloomberg Tax. The one-time repatriation levy places a 15.5 percent tax on cash and an 8 percent tax on assets. It was included in the 2017 U.S. tax act ( Pub. L. No. 115-97). The impact of the repatriation levy on non-U.S. multinationals highlights the global impact of the tax changes. Foreign pharmaceutical companies’ growth plans are the reason why the repatriation tax hits them most, said Benjamin Proce, a U.S.-based partner and life and sciences tax leader at PwC. “The pharma sector has particular seen a lot of deal activity in the past 10 years, with U.S.-based companies with foreign subsidiaries acquired by overseas businesses,” he told Bloomberg Tax. The repatriation tax targets the foreign profits that U.S. multinational companies like Apple Inc. and Microsoft Corp. stockpiled overseas to avoid domestic corporate taxes. In February, the United Nations said in a special report that the new U.S. law may lead to the repatriation of as much as $2 trillion. Since President Trump signed the 2017 U.S. tax act into law in December, 11 businesses listed on the primary stock exchanges of the U.K., France, Germany, and Italy have said how much they will pay in repatriation charges. The average is $22 million, according to data compiled by Bloomberg Tax. 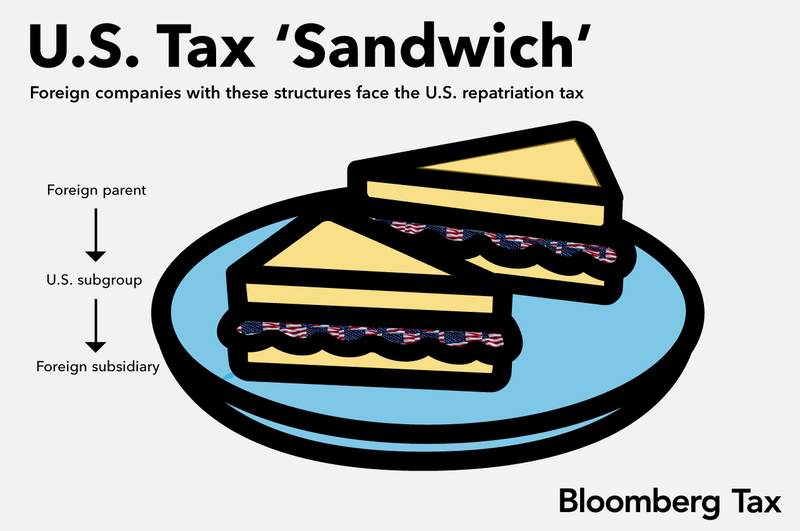 London-based EY partner and international tax services leader Matthew Mealey previously told Bloomberg Tax that any non-U.S. businesses facing the charge has a “sandwich” structure. In these cross-border set-ups, the companies’ U.S. subsidiaries are positioned between a foreign parent business, such as Sanofi, and a U.S.-controlled foreign subsidiary with offshore profits. Sandwich structures are more common among large drug-makers due to the pharmaceutical sector’s past decade of deal-making, Proce said. The industry has been “consistently global,” he said. The U.S. is a key region for drug-makers. The country is the world’s largest biopharmaceuticals market, according to SelectUSA, the U.S. government’s program to attract foreign investment. Between them, Sanofi, Shire, and GSK have consistently acquired U.S. pharmaceutical businesses. Shire’s $32 billion takeover of Chicago-based Baxalta Inc., completed in June 2016, made it the world’s biggest maker of drugs for rare diseases. Seven years before, GSK completed a $3.6 billion acquisition of Research Triangle Park, N.C.-based Stiefel Laboratories. Most recently, Sanofi announced in January that it would buy out Waltham, Mass.-based Bioverativ Inc. for $11.6 billion in an all-cash deal.None of the companies’ press offices responded to Bloomberg Tax’s requests for comment. Sodexo SA, the French food services and facilities management company, has given an insight into how a foreign multinational business may end up facing a U.S. repatriation tax charge. The Paris-based company had a charge because of dividends in an Canadian entity that Sodexo controlled via a U.S. subsidiary, Chief Financial Officer Marc Rolland said in a Jan. 11 sales results call. Sodexo “had left the dividend in Canada. So now, we will have to pay the tax on those dividends,” Rolland said. The charge is 23 million euros ($28 million), he said in an April 12 earnings call. Companies can spread repatriation tax payments over eight years. The bulk of the payment is due, though, towards the end of the period. According to the company’s Feb. 27 full-year results, GSK will pay 60 percent of its 348 million-pound ($496 million) charge between the sixth and eighth year. Bloomberg Intelligence government analysts Andrew Silverman and James Blatchford wrote in a Jan. 11 post on U.S. tax reform that companies may feel the effect of the repatriation levy from 2023. Yet as companies can bring back the money to the U.S. and reinvest it in the country, PwC’s Proce said the financial benefits arising from repatriating the overseas earnings may assist with the levy.